The D.Module2.ADDA500K16 is based on the Texas Instruments data converters ADS8556 and DAC8822. 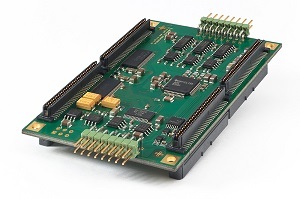 The analog front end digitizes up to 6 single-ended or 3 differential voltage inputs with 16-bit resolution and sampling rates up to 500ksps. The two DAC outputs also deliver 16-bit resolution. Input range and sampling frequency are user-programmable.